South African journalist and arts critic Charl Blignaut made what turned out to be an excellent prediction. “Of all the work on show, it’s this depiction of the president that will set the most tongues wagging and most likely generate some howls of disapproval,” he wrote on May 13 in a review of an art exhibition in Johannesburg. Indeed, a firestorm of controversy ensued: racial tensions, the burnings of copies of Blignaut’s City Press newspaper, a protest march, a regulatory hearing, and intense debate between proponents of free speech and press freedom and those of the rights to privacy and honor. Over a period of several days, South Africans did howl their disapproval—on Twitter. They howled not only at the Goodman gallery for exhibiting the painting (“Who does this to someone’s dad, grandfather and husband? And a president for that matter?? 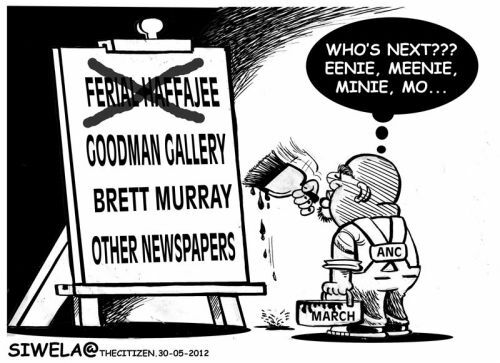 ?” asked @Gwi_Gwi) but also at City Press for displaying a photo of the painting on its website. “I think u are racist,I object to the depiction of a naked president with hanging private parts,” @GPhutiana sniped at Blignaut. “Just received a letter at work alleging that City Press is run by Satanists,” tweeted City Press News Editor Natasha Joseph on May 18. “Looking at a photo of people in ‘Vote Zuma’ shirts burning old copies of City Press, all of them grinning broadly,” Joseph tweeted a week later. Haffajee attempted to respond to the criticism. “We did not do the drawing; the only reason you know about it is because we published. Would you rather not know?” she asked @nkohlondi. “What the fundamentalists missed then, as they do now, is that we did not create the art of satire? Is dissemination, creation?” she asked. But it was only the beginning. “Remember, do not buy the City Press today. National boycott for disrespect,” said @nkohlondi on May 19. Five days later, the ANC released a statement officially calling on its supporters to boycott City Press, even as the party’s youth league publicly dissented. “Hug an #ANCYL member: the org has broken ranks and lambasted #ANC for City Press boycott and culture of intolerance! #Spear,” commented journalist Justice Malala. Others rallied to support City Press. “Tomorrow all who value a free and independent media should tweet a pic of themselves reading @City_Press! Tag it #myCityPresspic Join me,” tweeted journalist Patrick Conroy, head of private broadcaster eNews. Under pressure, City Press blackened the offending photo on its website, drawing some criticism. “You shouldn’t have taken down the #ZumaSpear until the judge gave a verdict. Now ANC have power over @City_Press,” @pemmymatsunyane tweeted to Haffajee. Amid some calls for the artist to be stoned, the ANC turned its attention to the Goodman gallery with a protest march, which also came under criticism. “What about #Zumaspear mobilises ppl to this extent,when lack of service delivery, corruption,crime, sexual violence don’t?” asked @zizwe.” “While #ANCMarch vs #Zumaspear: street kids across fm@Goodman_Gallery sleep rough,” noted @jozi117 with a photo of homeless kids. Then, the Film and Publication Board (FPB) summoned City Press for a hearing. “Complainant: when painting was placed on City Press website it should have had restriction of 18” read one tweet from City Press Assistant Editor Adriaan Basson, who was posting minute-by-minute updates of the debates. “Rasibi of FPB asks if mockery of president doesn’t amount to hate speech. [Lawyer Steve] Budlender: this board shd not look after interest of politicians,” read another tweet. In appreciation for instant updates, @NikolaiViedge said: “Loving the medium of Twitter right now.” “I can’t help myself: I’m glued to ‪#FBPSpear &‪#SpearMarch by a sense of turgid fascination,” said @m_lungu. In the emotionally charged debate, one notable observer—award-winning South African novelist, poet, and playwright Zakes Mda—stood out for his thoughtful and nuanced perspective. “All in all I think this debate (including litigation) is good for fledgling democracy,” he tweeted.